Catholic Charismatic Renewal (CCR), a spiritual movement that emphasises the joys fostering a personal relationship with God through embracing the Holy Spirit, is a global association that maintains an office in the Vatican. 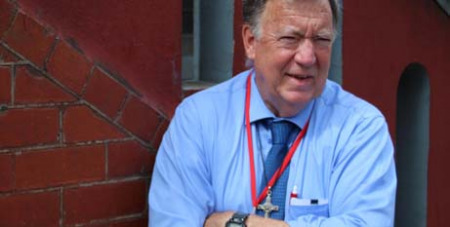 Jim Murphy, President of the International Catholic Charismatic Renewal, met with Melbourne Catholic to discuss the role of CCR in Melbourne and how the current of grace is pulling people closer to God in Melbourne, throughout Oceania and beyond. He said the Holy Spirit is working through Charismatic Renewal “to make Catholics even better Catholics”. “I find that the Catholics who have experienced Charismatic Renewal are much more attentive to the sacraments, have a deeper appreciation for the word of God and are more committed to service,” he says. As Charismatic Renewal continues to influence Catholics across the world, Mr Murphy says the Holy Spirit manifests itself within culture and context, reaching people to enhance and augment rather than dramatically transform individuals. “I’m always amazed by how God works and meets us where we are, making us the best version of who we can be. You are more authentically you with the Holy Spirit. It changes you at the core of your personhood,” says Mr Murphy. “There’s a great mystery in God and humanity. God is God but he always works in the context of culture. You take a Charismatic Catholic from Australia, one from Ghana and one from Canada and they’ll all be touched by the Holy Spirit but in different ways. However, while Mr Murphy says that accepting the Holy Spirit into one’s life can lead to a more fulfilling relationship with God, he concedes that embracing change and receiving the spirit can be challenging.